At times, I can be a weepy, nostalgia filled man whom is capable of connecting numerous dots between the present and the past I can't leave behind, even if they are rather random and seemingly inconsequential. A colorful, majestic tree covered in the brilliant hues of fall will take me back to a specific trip to the family cottage in Wisconsin, a place that will forever live in my mind but in reality we no longer own. As a baseball romantic, watching these Cubs playoff games recently almost function as a time machine to the day of coming home from school and instantly flipping on the television to catch the last few innings of a day game at Wrigley. I appreciate the now, but I always revert back to the past. Well, almost always. For some reason despite the fact that I was a huge fan of the Goosebumps book series growing up, I didn't feel the emotional strings of days gone by being pulled at my heart as I watched the new film. The screen was littered with characters and creatures that kept me up in my adolescence and yet at no point did I crack a smile thinking about those restless nights. My daughter was the one twitching with excitement to experience Goosebumps at the cinema, but I walked in with a sense of anticipation as well thinking of all of those books lined up in my room. The power of the past didn't cast a shadow over this new feature like I had hoped, which was a bit disappointing. What turned out to be even more surprising though is that despite this, the actual film based on its own merits really wasn't disappointing at all. 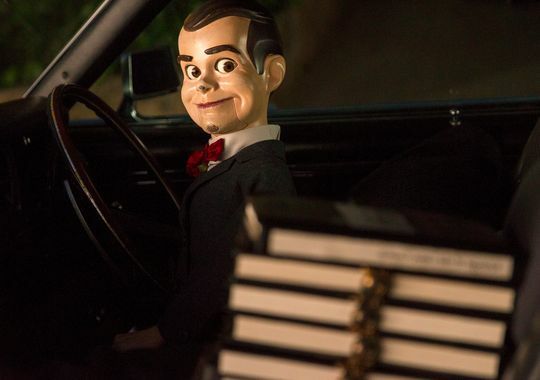 Goosebumps is a decent, pretty fun time at the movies. Far from perfect and probably not memorable in the long run, but you can do far worse than taking the family out for a night at the movies here. Jack Black may be the star of the group and might actually be the reason for a few extra tickets sold at the box office, but his performance as R.L. Stine was one of the weaker aspects of Goosebumps for me. Even though the picture is clearly meant to be silly and cartoonish, the way he plays this character took it even farther in those directions than I had hoped as I found his delivery and demeanor to be rather funny and I was only mildly amused by his antics from time to time. The rest of the cast, however, served as the heart and soul of the film, with Dylan Minnette in the lead as Zach, Odeya Rush as literally the girl next door Hannah, Ryan Lee as the enjoyably ridiculous new best friend Champ and the always terrific Amy Ryan as Zach's mother, Gale. These other characters do enough strong work here to make you care about their fate. Goosebumps won't even make my top 50 of the year when it is all said and done, and yet I can't help but recommend it for anyone looking to take their kid to the theater and watch them jump out of their seat a few times. It's not outstanding cinema, but it sure ain't bad either. Just wish it had scratched that nostalgic itch I was feeling. Damn, two recent movies in a row? Loving this, and surprisingly they're both positive. I thought this would be....ick...but lots of positive buzz on goosebumps. It isn't spectacular Cody, haha. I am always a bit biased towards movies that are fun enough that I get to enjoy with my kid, so I find a lot of times people are way more critical of stuff like Goosebumps than I am. Still though, didn't mind this film at all. Don't be surprised if you see a lot of 2015 releases coming through here in the near future. Time for me to catch up on everything imaginable to be able to assemble my 50 best of the year I do annually by the time the Oscars roll around.